There is no better way to relax your tired muscles from a stressful day than immersing in a portable spa at the comfort of your own home. If you are planning to buy a new portable hot tub for the first time, it is advisable to get a simple spa in a box that doesn’t require a lot of technical know-how but doesn’t compromise nor short-sale you on quality and performance. The Dream Maker Spa (model X-100) is a portable tub that can seat 5 persons and is easy to assemble by yourself. Despite its simplicity and straightforward design, the Dreammaker Spa boasts a powerful jets and hydrotherapy pumps. Does the Dream Maker Hot Tub live up to its name of making dreams a reality? Let’s see how true that is. If a spacious hot tub is what you need so you can enjoy lots of quality time with your family and friends, the Dream Maker is perfect to comfortable seat up to four adults. It is designed for five persons, but you may not be able to fully stretch out if you max the seating capacity. 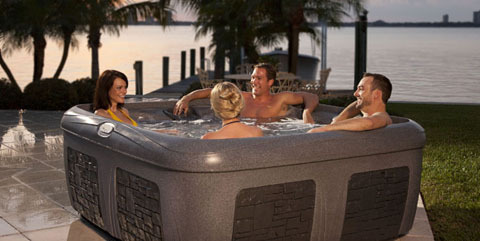 Dream Maker is known for 100% portable and lightweight hot tubs. At 190 lbs, the Dreammaker X-100 doesn’t give you a hard time to carry around your home wherever you want to place it, whether inside the house or in your backyard. If it’s winter and you have enough space inside, you can live your dream of a warm tub in your bathroom whatever the season is. Just make sure that you install the tub on a level, solid, concrete floor if you put it inside your house. The tub is compatible with regular 110-volt outlets so you do not need a technician to install it. You can simply plug and play. Warming up the water in the spa may take some time, though. You may have to wait around 20 hours for the water to heat up to around 100 degrees and may take even longer if the weather is cold. In addition, Dream Maker spas parts are designed with a 1.8 lb, full foam insulation to help decrease operation costs while being friendly to the environment. Five 1.5 HP hydrotherapy jets are built to yield high performance. The air controls on the sides enable you to adjust the air level in the jet system so you can match the air and water that you need. Since the soft tub is round, the powerful pressure of the pumps is felt in all angles, giving you a totally relaxing massage at the comfort of your home. Looking at the negative aspects, the Dream Maker Spas can only be installed inside your house or if the weather is mild. If your house is located in the colder areas, you will have to wait for the water to heat up to the temperature that you like. On a positive note, Dream Maker has put together some value-added features like an artificial waterfall that changes color randomly, giving you a relaxing atmosphere as you relax in the water. The pumps have been increased in power because of the high-performance jets installed in the tub. Ultimately, whether you are buying a hot tub for the first time or you just need to upgrade your old Cal Spas, the Dream Maker X-100 Portable Spa is an excellent pick for a user looking for a portable hot tub that helps you save money without letting you down on performance and quality. This entry was posted in hot tub reviews, hot tubs for sale, luxury, Portable hot tub, spa and tagged best hot tubs, cheap hot tub, hot tub reviews, leisure bay spas, luxury spas, spa, spa for sale. Bookmark the permalink.